Weekends off with Bernie, one or two? COACH Don Pyke is waiting to see how Adelaide performs against in-form Geelong under the Friday night lights before declaring his side has overcome its mid-season blues. The Crows reclaimed top spot on Saturday night with an impressive 46-point defeat of an understrength Melbourne in Darwin, in a match laced with highlights, incidents and injuries. But staying there will depend on Adelaide snapping its five-game losing streak against Chris Scott's Cats. The Crows' 22-point round 11 defeat to Geelong was part of a period where they lost four of seven matches after a 6-0 start. "When you lose some games, you learn, and we learned through that period there were certain ways sides were trying to play against us," Pyke said. "We had to adapt and do some educating with our playing group and we get another great test next Friday night against Geelong, a side we haven't previously performed well against. "We'll see whether we've made any progress, in terms of what we've learned from the previous games against them, but you’re always learning in this game – even from tonight we learned some things." Pyke was delighted with his forwards' output, which he credited to his players' pressure around the ball further afield and delivery into attack. 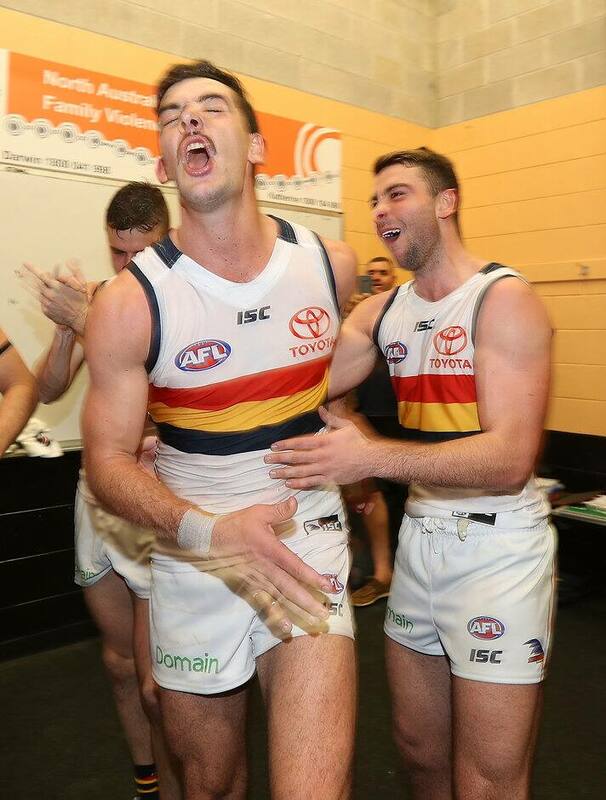 Captain Taylor Walker and Mitch McGovern were instrumental from the outset, and Tom Lynch (27 disposals, 11 marks, three goals) performed strongly in his return, after being hospitalised with viral meningitis. "It was fantastic for Tom. He was in my office last Monday morning saying 'I'm ready to go' and moving his magnet onto the board, which was great," Pyke said. "He's always been really positive and loves his footy and we're probably just mindful of his total game time (because) he normally plays pretty high game time for us. We tried to manage him a bit tonight, but I thought his return was outstanding. "(Walker) was very good last week for us and again from a leadership viewpoint, really strong in terms of how he plays and that sets a really strong standard for the rest of the group, so another really good night for Tex." Pyke also defended star on-baller Rory Sloane's latest quiet night, which ended in the third quarter when his head hit the ground hard in a Dean Kent tackle. Sloane had just eight disposals at the time, opposed to Demons tagger Bernie Vince. "I think Sloaney contributed in other areas again. I've said it often; we're not about needing Rory Sloane to get 25 to 30 touches for us to win games of footy," Pyke said. "Rory had a job tonight – he did something slightly different again – (and) continues to put great pressure on around the ball and continues to lead. "He'll get days where he gets more footy than he did tonight, but it was one of those one-on-one battles which sometimes go our way and sometimes don't."